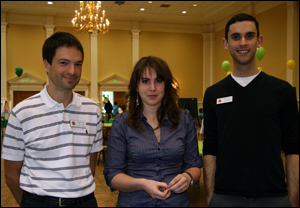 Left to right: Associate Professor Michel Cukier; ENSIB exchange student Mélissa Quinet; Caine Francis, Coordinator of International Engineering Programs in the A. James Clark School of Engineering. ISR-affiliated Associate Professor Michel Cukier (ME) is the instructor of a new study abroad course in France, "Risk Assessment in Engineering." ENES 458F, which debuts in summer 2009, is offered through the University of Maryland's Study Abroad Office in partnership with the Bourges Higher National School of Engineering (ENSI Bourges). The four-credit undergraduate course provides an understanding of risk in engineering and the techniques used to evaluate it. Risk in engineering has become a strategic economic issue because of ever-growing safety requirements. Industry must be increasingly irreproachable with regard to risk, which must be evaluated and mitigated constantly whatever the field of activity in question. Fields especially impacted include chemical, metallurgy, nuclear, agribusiness, packaging, plant and equipment, pharmaceutical, waste treatment, transport, the Internet, and data management. Risk in specific domains will be discussed, including fire and explosions, chemical plants, finance, software development, environment and nuclear plants. Field trips to a missile factory, an armor factory, a nuclear plant and a wine producer are included in the four-week course, May 30–June 27. Students will study at ENSI Bourges' School of Risk Management Engineering in Bourges, France, about 150 miles south of Paris. (Click here for a PDF overview of ENSI Bourges.) They will live in houses shared with French families, providing a unique experience of French culture. ENES458F is but one study abroad option offered to students through International Engineering Programs, which assists engineering faculty in developing short-term study abroad programs, coordinates semester and year-long exchange programs for engineering students, and advises students on the minor in International Engineering. Students can study engineering in locations around the globe, and their participation in study abroad increases every year. Interested faculty and students should contact Caine Francis, Coordinator. Cukier is affiliated with the university's Center for Risk and Reliability. His research interests include security quantification, intrusion tolerance, distributed system validation and fault injection.